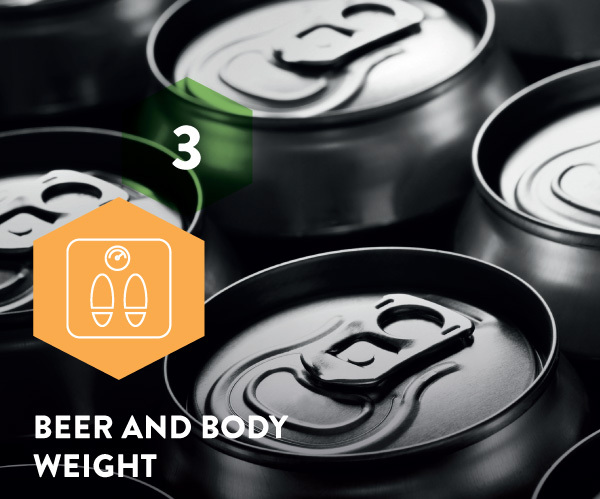 There is a widespread belief that alcoholic beverages, and beer in particular, lead to weight gain, especially around the abdomen. However, scientific evidence is not clear. Alcoholic beverages certainly contain calories but it seems that weight gain is mostly associated with higher intake levels. Moderate alcohol consumption, particularly in women, seems not to be associated with weight gain. In beer, about two thirds of the calories come from the alcohol and about one third from the carbohydrates. It seems that weight gain is mostly associated with higher levels of drinking beer and other alcoholic beverages, and not with moderate alcohol consumption, particularly in women. 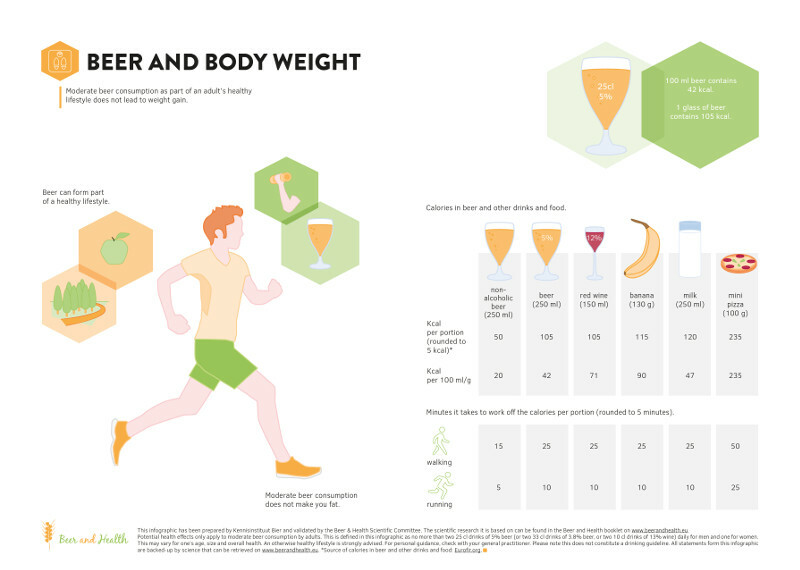 The relationship between body weight and alcohol consumption is complex, involving not only the amount and type of alcohol consumed, but also drinking patterns, gender, beverage type and lifestyle can play a role. The relationship between alcohol consumption and metabolic syndrome risk seems to be J-shaped, with reduced risk associated with low alcohol consumption and higher risk with heavy drinking. Obesity is a multi-factorial condition and it is difficult to truly assess the independent influence of alcohol intake on obesity risk. If you eat more calories than you burn, you gain weight. Energy from alcoholic beverages is additive to that from other dietary sources. However, data from population studies suggest that moderate alcohol consumption may protect against obesity, particularly in women.56 Several studies investigated the influence of alcohol consumption on appetite, body weight and obesity. Overall, it appears that light to moderate alcohol intake is less likely to be a risk factor for obesity than heavy drinking and binge drinking, which have been more consistently linked to adiposity.54 A systematic review shows that weight gain is seen with high levels of alcohol consumption. For moderate consumption there is a difference between beverages. Wine seems to protect against weight gain whilst spirits tend to promote weight gain.58 But with beer, there is not enough scientific evidence, especially for women,41 though based on a systematic review it seems that consumption of up to 500 ml per day for men does not contribute to weight gain. The relationship between body weight and alcohol consumption is complex. Not only are the amount and type of alcohol consumed important, but also drinking patterns, gender, type of beverage and lifestyles may play a role. On average, men require some 2,500 kilocalories (kcal) a day, while women require 2,000 kcal. If a person consumes more calories than necessary and fails to exercise enough, then weight gain will result. Food and drinks both provide calories (see Table 3).